Global challenges do not respect borders. 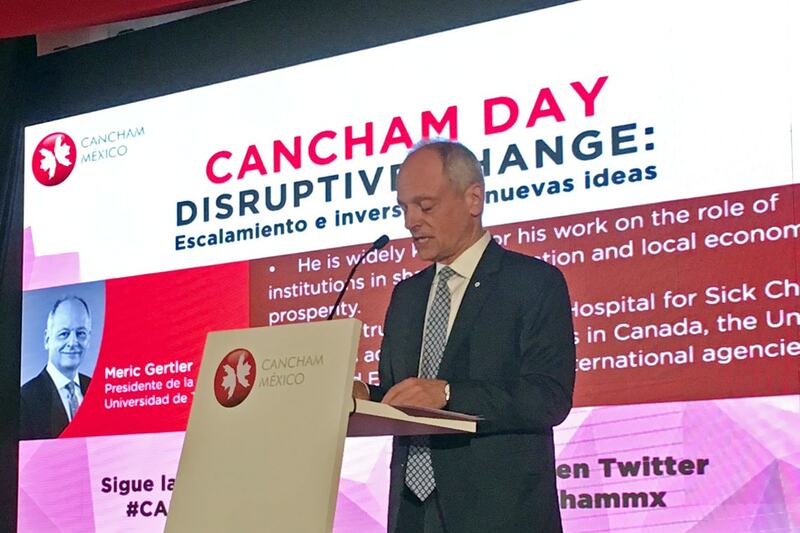 In an era of economic turbulence and digital disruption, advanced education and international research collaborations are more important than ever, University of Toronto President Meric Gertler said in a speech in Mexico City on Tuesday. “In a world worried about a future being disrupted by automation, artificial intelligence and machine learning, society must look to universities to help prepare the citizens and leaders of tomorrow,” he told a crowd of business executives, academics and Mexican press gathered in a downtown hotel for an event organized by the Canadian Chamber of Commerce. Gertler led a two-day U of T delegation to Mexico City to foster deeper educational ties with Canada’s partner in the North American Free Trade Agreement (NAFTA), as well as acknowledge the Mexican government’s special funding for 150 graduate scholarships. He was accompanied by Ted Sargent, U of T’s vice-president international, Josh Barker, dean of the School of Graduate Studies, Allan Kaplan, vice dean of graduate and academic affairs in the Faculty of Medicine, Brian Golden, vice dean of MBA programs at the Rotman School of Management, and others. Gertler’s address to the Canadian Chamber noted that U of T is committed to preparing students to be global leaders who can make a global impact. “While other countries want to build walls, we want to build bridges,” he said. Over the past 25 years, growth in international research co-publication has exploded, increasing more than tenfold, he noted. U of T students and scholars authored more than 18,000 peer-reviewed publications with colleagues from 170 countries – second only to Harvard in the world. That number included more than 300 publications with colleagues in Mexico, in fields from rheumatology and astrophysics to economics and electrical engineering. U of T aims to grow these ties and is proud to welcome Alán Aspuru-Guzik, a Harvard professor and leading researcher in theoretical and computational chemistry, as a Canada 150 Research Chair, Gertler said. As technology rapidly changes medicine, finance, law and other fields, universities must ensure students learn not only technical skills, but also the value of communication, critical thinking, problem solving, quantitative reasoning and ethical reasoning, he said. These skills are crucial to address the current challenges of intolerance, nativism and inequality. He highlighted the importance of experiential learning, as well as the inverted classroom, where students look at course materials ahead of time, and then achieve a deeper understanding of them during classes that focus on problem solving and active learning. The pinnacle of experiential learning may well be the startup – students starting their own companies to commercialize university discoveries and inventions. “That is one reason U of T encourages entrepreneurship and innovation. Since 2013, we have created more startups than any other single institution in North America,” he said. Gertler noted that Times Higher Education recently ranked U of T the top public institution in North America in terms of graduate employability, and 13th overall, ahead of universities such as Oxford, UCLA, University of California, Berkeley, and the University of Michigan. U of T has nearly 20,000 international students from 168 countries, including 250 from Mexico. During a reception Tuesday evening hosted by the Canadian embassy, Sargent and Aspuru-Guzik spoke about how artificial intelligence can speed up the development of clean energy, with Canada and Mexico leading the way.